The Government of India ratified the UNCRC on November 12, 1992. While progress has been made in several areas of child development with hard work by the Government, various NGOs and the civil society, it seems that schools hardly look at these rights as part of schooling process. One of the main reasons for such an approach is that many schools are not aware of these rights and even those who are aware do not know how to connect them with schooling processes. There are several NGOs who have been focusing on one right or the other, but never on all these four rights together, as a whole. Such a disconnect from these rights poses a challenge in ensuring rights compliance in schools. 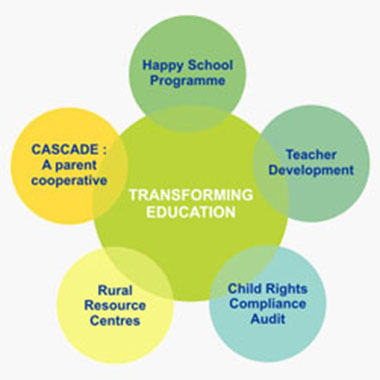 Relief Foundation has developed a unique model of establishing Child Rights in the school context called Child Rights Compliance Audit. With strong backing of the Montessori Philosophy and Child Rights, we have looked into every aspect of the schooling process and have covered all the stakeholders involved in the development of a child. For existing schools, we could use this model to audit all the areas and share the outcome with the concerned school management. Confidentiality on the outcome of the audit will be fully maintained. A confidentiality agreement can be signed between Relief Foundation and the respective school before the audit. School Board members who are interested to take it further can approach us for further support through our Happy School Project for schools. For new schools, this model can be used as a reference point to build a child friendly environment right from conception up to completion. Relief Foundation offers scholarships to individuals who are willing to take up Montessori courses from select Institutes in India and take up postings in rural areas to install Montessori rural small schools and serve in their capacity as Classroom guides and change agents for the immediate community on education reform for a period of minimum 3 years. For details write to - relieffoundationindia@gmail.com . Teacher Development We interact closely with teachers to empower them, first as human beings, and then as teachers. Apart from improving subject-specific knowledge of the teachers, our training focuses on observation (of oneself and the student) and provides strategies to cater to the various learning needs of the student. We aim to inculcate a sense of creativity, humaneness and intelligence in the teaching process..
We offer pre-service development programs through our Teacher Development Initiative called The Teachers' Lab. These pre-service programs are in the form of a Fellowship, whereby candidates undergo training for a certain period followed by classroom teaching. The rigour of the Fellowships and the constant mentoring and support are hallmarks of this initiative.. Monitoring & Support Our biggest challenge is in monitoring the efficacy of our training programs. Often teachers are not able to translate their learnings to the classroom. Therefore, subsequent to the training, constant support is an absolute must. Other than support, we are specifically interested in assessing if the training has enabled teachers to become more observant, creative and caring. This monitoring provides us with plenty of feedback and informs subsequent workshops. Our experience in the field of vocational education has prompted us to set up a Counseling desk for students seeking assistance or guidance for taking the vocational route to higher education. We offer information on a range of avenues available for 10th and 12th standard students and also for women at home, to come together as a self help group and start cottage industries in their homes. This has improved the economic conditions of hundreds of families as the students start earning within one year and the women at home too take up responsible vocations contributing to the family income. Students, if their interest lies in academics, are shown options of pursuing the academic route while taking up short term courses that can give them part time jobs. This helps them to earn while they learn and they are able to take care of their expenditure and fees. If you are a student or a corporate or an NGO that's looking for more information about our counseling desk, write to us @ relieffoundationindia@gmail.com to fix up an appointment.